This book snatched my edges. I have looked myself in the mirror and have finally said it. Boxes and boxes full of books. They need to go! Well, many of them. For those of us with clutter issues and so-called collections, check out this book. Kingston is very straight forward and no-nonsense on why we need to get our houses together. Clutter equals chaos. And we don’t need chaos in our lives, right? This book is easy and quick to read. There is info on why we should clear our clutter, where to start, and even how to start. If this book doesn’t motivate you to get up and get rid of all the stuff you don’t use or need, I don’t know what will help you. I do feel better after clearing up my space. I hope I especially cleared out the prosperity, journey, and knowledge areas. I need some prosperity up in here! 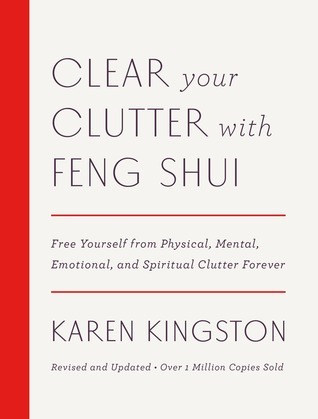 If you need some extra help clearing out your clutter or are a bit interested about the feng shui zones in your home, check it out. Clearing up clutter never hurt anybody!